Every element added to a website created in website builder WebWave has a set of basic attributes which define its style and alignment. Each of those attributes can be changed in the Settings Panel. 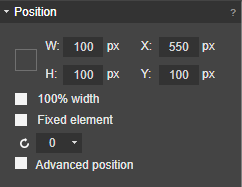 In this section, you can set element size and alignment, make element take 100% width of a website and pin it to a particular place on a website. You can set element width (W) and height (H) in pixels by hand or see its measurements when you change element size using a computer mouse. If you want the element to keep proportions, select a big square next to W and H.
If you want all the elements to have the same size, select them all and set width and height in the Settings Panel. Change element alignment by setting its distance in pixels from the left side of your website (X) and top of it (Y). If you like to preciselly place elements on your website, in WebWave webdesign software you can set elements position up to 1px. Keep in mind that X is a distance from the left side of a website, not the builder! When you tick a box next to "Fixed element", you will pin this element to a certain place on a website and it will always be displayed in this particular location. This feature comes handy when you want a menu to be always visible. Users can scroll the website, but the menu will stay in the same place on the screen. Selecting this feature will make element take 100% width of a browser tab. In this section, you can set parameters, which apply to element style. 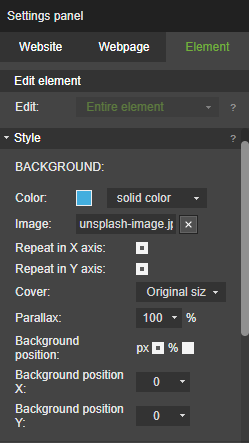 Set background color, its visibiliy or make an image a backgrund of the element. In this section, there is only one attribute, which allows you to set element visibility. If you are changing the style of a text element, the text will also become transparent. In this section, you can set element border - its color, thickness, and shape. What's more, you can make element edges rounded. Choose any border color from the color palette or make it transparent. Border width is set in pixels. Change of border thickness doesn't influence element size, only its "capacity". Four options will help you choose, which part of a border will be visible (top, bottom, left, right). This feature allows you to round borders of an element. Set roundness in pixels. Cast a shadow on the element. Setting element padding makes sense only for elements with images or text. Enter measurements in pixels and draw element from its borders.